These quick kid friendly "GF/ DF AND GRAIN FREE FRIED FISH BITES" sure beat the ones in the frozen food section. Yes, you have to actually buy fish, coat it and fry it, but, I am telling you, these are healthier, not to mention also, gluten/dairy and grain free and ever so good! Plus, when you make these from scratch, you actually know what you’re getting, while It is hard to say with some of the packaged options out there. 1/2 cup mayonnaise Note: I use homemade (see my Homemade Mayo recipe). Combine the coconut flour, sea salt and pepper, garlic powder and cayenne pepper in a bowl. Coat each fish bite in the coconut flour mixture. Then coat in the eggs. Next, press the fish bites in almond meal. Repeat with all the fish bites. Place about 1-2 tablespoons of the coconut oil in a large skillet. Fry the fish bites in batches for about 2-3 minutes on each side over medium low until golden brown. Add more coconut oil to the skillet, as needed. Combine all the ingredients in a bowl and stir until well mixed. Place in the refrigerator for at least 10 minutes for the flavors to combine. Serve the dipping sauce with the fish bites. Enjoy! Can I come over and get some right now? Any leftovers?? :) Gotta pin this and make some!! 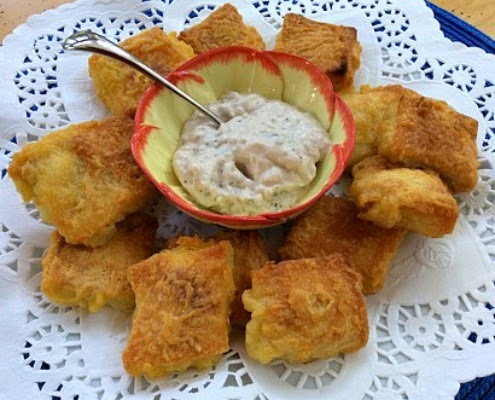 Thank you for sharing your recipe for Gluten/Grain/Dairy Free Fried Fish with Foodie Friends Friday party this week. Pinned/shared.